A few years ago, CNN named Morocco’s capital, Rabat, as one of the top places to visit. Is the city worth a detour or more? 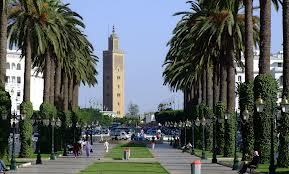 Visitors to Morocco usually head for Marrakech, Essaouira or Fez and don’t even consider Rabat. It’s not a premier tourist destination, but perhaps that’s where it’s charm lies. There’s no hassle, no touts, no pressure to buy. The medina is small, there are some interesting sites to explore, wide, sandy beaches and excellent restaurants. The weather, too, is less extreme than other imperial cities. So what’s made Rabat suddenly ‘hot’? It all started in July 2012 when UNESCO designated the city as a World Heritage Site, citing its “fertile exchange between the Arabo-Muslim past and Western modernism” as the reason for the recognition. This means that the city was suddenly on the travel radar, there to be noticed, attracting attention. The expanded airport is served by new routes and there’s better public transport within the city thanks to the new tramway that links Rabat to its sister city, Salé, across the river Bou Regreg. 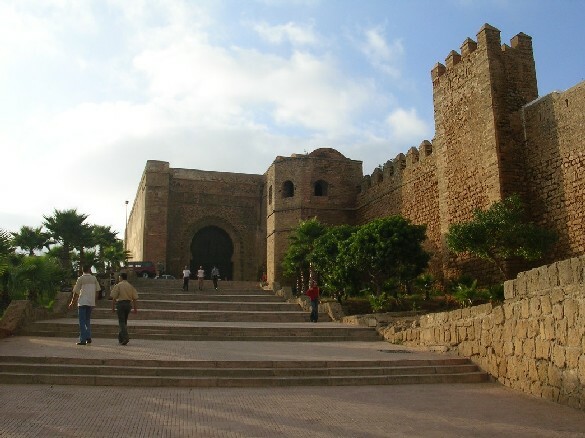 Rabat has only been Morocco’s capital city since independence in 1956. It is a laid-back city with clean, wide boulevards lined with palm trees. HM King Mohamed VI lives here in his Royal Palace and as the administrative capital, there are lots of consulates and embassies. It doesn’t have the gritty port-city feel of the economic hub, Casablanca, that lies just down the coast. It’s much more refined and cosmopolitan and has a lot more to offer the visitor. Don’t miss a wander round the Kasbah Oudaias. It’s quite separate from the city, and overlooks the mouth of the Bou Regreg river. Built as a fortress, it now houses an excellent museum and outside you’ll find the shady Andalusian gardens and the Café Maure, just the place for a relaxing with a mint tea. In the little kasbah medina are interesting shops and art galleries and a couple of places to stay. The ornate mausoleum of the King Mohamed V is worth a visit, as is the nearby Tour (tower) Hassan. This was to be one of the largest mosques in the world, but Sultan Yacoub al Mansour died before it could be completed and an earthquake in 1755 finished off most of the remains. All that can be seen today are the pillars, surrounded by pleasant gardens. 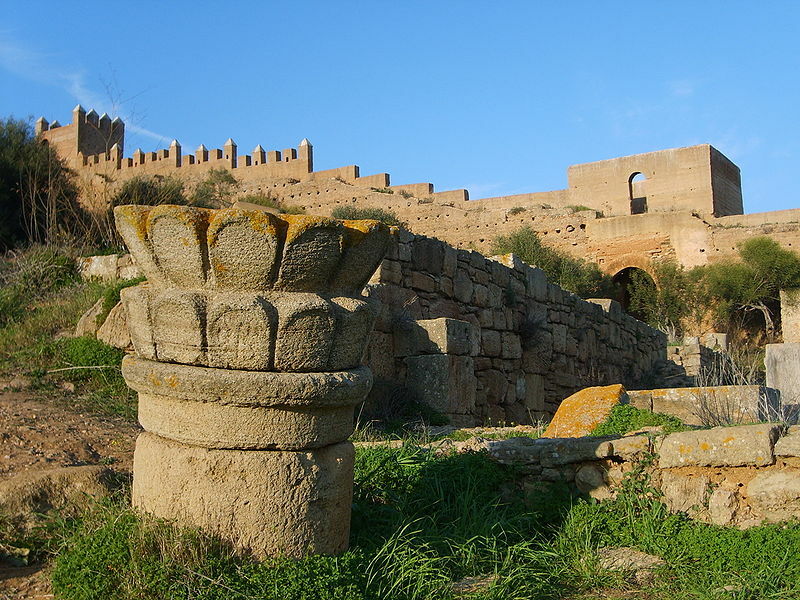 On the edge of the city is the peaceful Chellah that has remains of the Phoenician, Carthaginian and then Roman city of Sala Colonia and of an Islamic complex. It’s quite overgrown and there are lots of fruit trees and shade for a hot afternoon. A huge stork’s nest sits atop the old minaret and in spring there’s lots of clacking of beaks (not for nothing are they called ‘laq-laq’ in Arabic!). This is a perfect spot for children to let off steam. You can also take them to the large zoo, and to the beaches of Tamara in the southwest and Plage des Nations to the north. 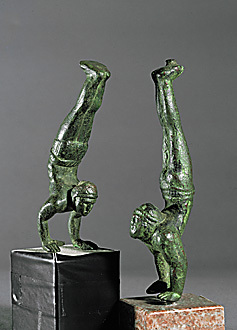 In central Rabat you’ll find the small Archaeological Museum with its treasures from Volubilis, such as the remarkable bronzes: the head of King Juba and the tiny acrobats and other figures. Whether these will remain in this museum is a moot point, as a new museum has being built at Volubilis itself, but for the moment they are in Rabat. The small medina lies on the seaward side of the city and has plenty of fine carpet and furniture shops. As there are few tourists in Rabat, the shopkeepers are not at all pushy and wandering around here is a pleasure. In addition, there are some splendid places to stay: old traditional houses that have been restored and now operate as riad guesthouses. Some have also been converted into restaurants where you’ll find excellent traditional Moroccan cuisine. Back in the modern city are some great eating options, too. Le Petit Beur is best for Moroccan cuisine; the trendy Veranda at the French Institute near the Cathedral and the nearby Typotes serve excellent lunches in the garden. There are good fish options along the coast, and more international cuisine at Les Sessions du Piétri and La Mamma. The trendy suburb of Agdal has yet more restaurants, and a couple of nightclubs. The new marina has some excellent restaurants, mostly featuring fish, such as Marco, Marsa and Quai de Bouregreg. Finally, hop on the tram and head across the river to Salé. The zawaiya (saint’s shrine), medersa and mosque are all worth visiting (although you can’t enter the mosque unless you’re a Muslim). Steeped in pirate history and home of the 16th century Sallee Rovers, this is a town stood still. While its elegant sister blossomed as the country’s capital, Salé doesn’t seem to have moved on at all, although now that it’s connected by the new tramway, there are signs that it will catch up. The new yacht basin, marina and shopping malls will see to that, even if you can still hire a man and his rowboat as an alternative to crossing the river on the smart new bridge. So is the city worth a visit? Yes, we think that if you have the time, it’s certainly worth a night or two to explore a little-visited capital city. Its blend of modernity and tradition, elegance and laid-back atmosphere make Rabat a pleasant respite from the intensity of Fez and Marrakech.